Integrify supports the ability to import an entire process definition from one installation of Integrify to another installation of Integrify. When a process is imported into Integrify, it will be a mirrored image of the process and will contain everything you built for that process in the other Integrify installation. The only exceptions being that any attached files to the process, and any task type that requires templates (PDF and Excel task types) are not included in a process export. Those templates and attachments will need to be added to the imported process, and the task will need to be reconfigured. 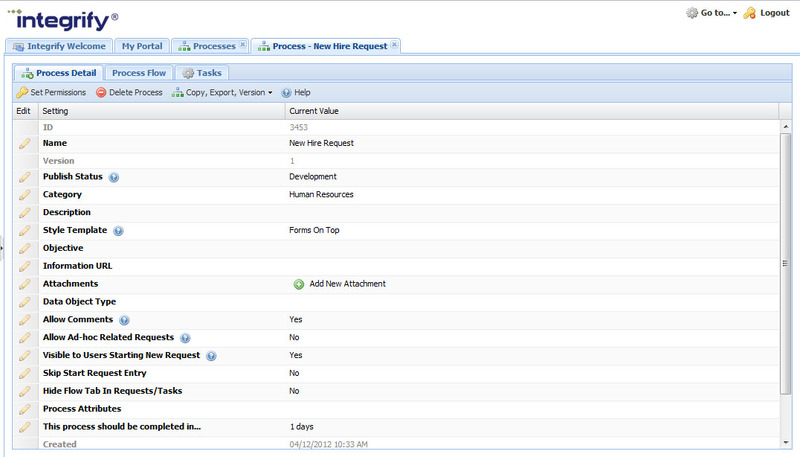 To import a process into Integrify, navigate to the Processes section under the Administration menu. Select the drop down arrow under Add New Process. Name: The name of the process. Import to Category: Select the category where the process will be placed. Process Export File: attach the .IPML export file that was generated by Integrify when the process was exported. Create new ID’s (optional): If you select this option, the import procedure will generate new id’s for the process and all tasks. If left unchecked the import procedure will use the process id and task id’s as defined in the export file. Select Import Process when the required items have been completed. Additionally, any forms associated with the process will be stored in the same category you selected when importing. The form name will also be appended with the name of the process you defined. The original name of the form was just: New Hire Form.